Cmdr. C.B. 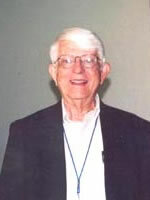 Scott Jones, Ph.D., USN (Ret. ), is a former officer with the Office of Naval Intelligence and other Agencies, with 30 years service in U.S. Intelligence overseas. He was involved in government research and development projects for the Defense Nuclear Agency (DNA), Defense Intelligence Agency (DIA), Defense Advanced Research Projects Agency (DARPA), the Army Intelligence and Security Command (INSCOM) and other organizations. He also is a former Senate aide to Sen. Claiborne Pell, who has had a long-standing interest in UFOs and the paranormal, *and has tried to get Congressional Hearings held on UFOs; President, Human Potential Foundation; and "point-man" for Laurence Rockefeller on UFO matters. Some authors refer to Jones as a member of the Aviary, known as CHICKADEE. From the Exopolitics Institute: C. B. Scott Jones, Ph.D is founder and president of the Peace and Emergency Action Coalition for Earth. Previous to this he was co-founder and president of the Human Potential Foundation. Prior to this position he was Special Assistant to Senator Claiborne Pell from January 1985 until March 1991. Retiring as a Commander in the U.S. Navy, approximately half of his thirty-year naval career was spent in intelligence service overseas and in the United States. In 1989, he and Senator Claiborne Pell co-founded the Human Potential Foundation that was involved in a number of research projects. Under the Center for Interspecies Communications, the Human Potential Foundation conducted Projects Neptune Helper I and II, dolphin research with Atlantic Bottlenose and Spotted dolphins. A major two-year program funded by Laurance Rockefeller was completed with an international conference, When Cosmic Cultures Meet, in Washington, D.C. in May 1995. In November 1998, the Human Potential Foundation was dissolved and its principal undertaking, a global peace initiative, transferred to the newly established Peace and Emergency Action Coalition for Earth, Inc.
C.B. Scott Jones is a member of the Advisory Board of the Exopolitics Institute.